Annnnd breathe. Real Madrid's win against Bayern Munich to book passage into the Champions League semifinals was absolutely bonkers. We saw penalties, red cards, extra time and a whole lot more as the Spanish side rolled up a 4-2 win in extra time to advance 6-3 on aggregate. Here are 10 things we took away from the match. The Real Madrid faithful showed their reverence to a pair of familiar faces in the pre-match introductions. Former manager Carlo Ancelotti and ex-midfielder Xabi Alonso were both applauded as their names were announced. The same can't be said for the rest of the Bayern Munich team, but the Santiago Bernabeu did the classy thing with a round of applause for their former leaders. The pair won a number of trophies during their time in Madrid, including the Champions League, so it was nice to see that acknowledged. Once the ball kicked, though, it was game on. Down 2-1 to open the match on aggregate, Bayern knew they'd need at least two goals to advance or force extra time. 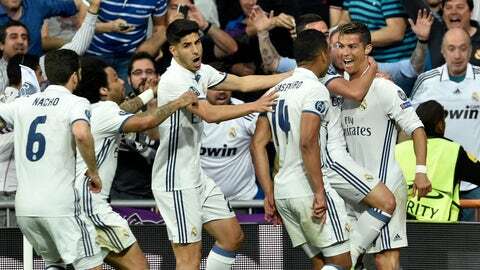 They opened the match with purpose, peppering crosses and firing ambitious diagonals to try and open up Real Madrid. The long balls didn't come off in the first half, and save for a diving block from Marcelo in the ninth minute Bayern didn't have much to show for their persistence. Still, it was the right attitude. The hosts grew into the match shortly after the early onslaught and managed to craft a number of their own quality chances. Dani Carvajal isn't known as a world-class striker of the ball, but the man can put his leg through one when he wants to. He did just that about midway through the first half, launching a low-flying shot that was fizzed toward Neuer's far post. Somehow, the German goalkeeper got low enough to push it aside and keep it out of the net. So incredible was the save that the referee must have assumed it impossible to get to, as he blew for a goal kick rather than a corner. Add in a few more spectacular saves and it was business as usual for Neuer. The Real Madrid fullback can be frustrating to watch sometimes, but he was nothing short of fantastic on Tuesday. He made an early diving stop on a shot from Thiago in the box, and popped up for a brilliant denial on Arjen Robben in the 51st minute. The Brazilian was his usual effective self as part of Real Madrid's attack, but it was his energy on the other side of the ball that really stood out. To cap it all off, after 110 minutes of nonstop running, he stormed down the entire pitch through Bayern's defense to lay off for Ronaldo's third goal. He gets a lot of flak for diving, but Robben earned a penalty for Bayern Munich's opener. Casemiro appeared to make contact with the Dutchman in the box, even if it was slight. 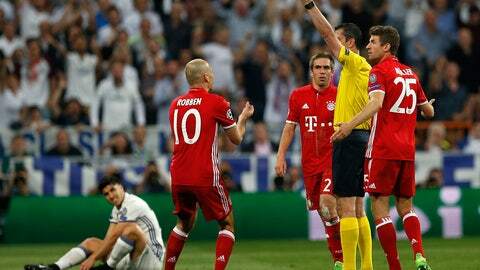 Yes, Robben embellished in a big way (like he usually does), but the call from referee Viktor Kassai to point to the spot was correct. Robert Lewandowski made no mistake to give Bayern a 1-0 lead. Luckily the incident wasn't compounded with a card, though. 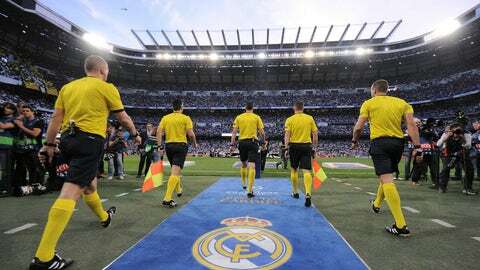 Casemiro had a yellow already, and another would have seen him handed his marching orders. It could have been much worse than giving up a penalty for Real Madrid. Another match, another goal for Lewandowski against Los Blancos. Coming into the match, the Polish striker had scored five goals in five matches against the Spanish side dating back to his time with Borussia Dortmund. With another crack at Real Madrid, Lewandowski delivered again. It came in the form of a penalty kick, but it was a no-doubter. The Bayern played chicken with Keylor Navas, waiting for the keeper to make a move before sending his goal-bound shot in the opposite direction. What the heck happened in the 78th minute? After Cristiano Ronaldo scored in the 76th, it looked like Bayern were just about done for. Then, all hell broke loose. A long ball found Thomas Muller in the box, who chested it down for Robert Lewandowski. 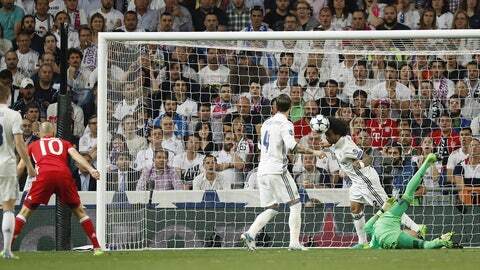 Three Real Madrid defenders and goalkeeper Keylor Navas conspired to totally wet the bed, as Sergio Ramos poked the ball back into his own net. It was utter madness, but Bayern were happy to take the goal however they could get it. Two players were playing with fire for much of the match: Arturo Vidal for Bayern Munich and Casemiro for Real Madrid. Both were on first-half yellows and needed to exercise caution heading into the final stretch ... yet neither did. Casemiro made a number of dangerous tackles that could have easily resulted in a second yellow, but the referee kept the card in his pocket. Then, Vidal made a dicey tackle that, based on the referee's in-match record of not sending people off, didn't warrant a yellow. And yet, the yellow was brandished and Vidal was sent off, changing the complexion of the match. When it's all said and done, both teams deserved to win the match and had every reason to believe they could. Alas, we were denied a fair fight as the officials kept messing up calls and influencing the match. Nobody is perfect, that's for sure, but Viktor Kassai and his assistants had a very poor match. Ronaldo was offside on his eventual match-winner, which, credit him for finishing, but still. Factor that non-offside call in with some other dubious decision-making, and it's a shame that the referees will be the ones that will be talked about in the coming days. 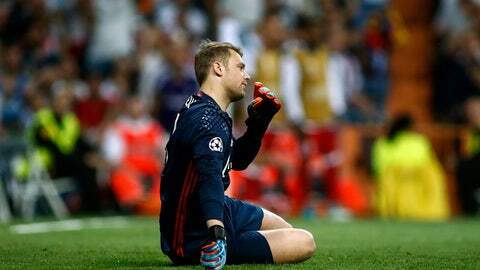 By the end of 4-2 win, Real Madrid were toying with Bayern. The tie had gotten out of hand and the German side were already down a man. Also, Bayern's starting center back pairing were fitness questions coming into the match. Expecting them to be able to huff and puff for 120 minutes is asking the world. Real Madrid deserve credit, though. They brought it in a big way to completely and utterly showed zero remorse in putting Bayern Munich to the sword.